Below and around the Monastery of Saint John is Chora. 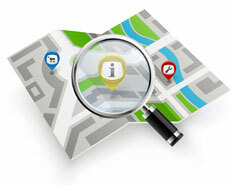 The outstanding network of the narrow streets feels like wandering about a beautiful labyrinth. It resembles a fortress which is full of whitewashed houses and mansions, dating back from the 16th century. Rich houses wouldn’t be distinguished from the poor, to avoid been targeted. Their close distance would form a wall used to defend against pirates. There is a strange feeling of mysticism and tranquility in just about every corner. From the top of the hill, the visitor can get a magic view of Skala and the central area of the island of Patmos. Skala is the port of Patmos, thus the most active part of the island. The coastal road if full of cafeterias and restaurants, where you can enjoy the delicious appetizers and drinks just beside the sea. 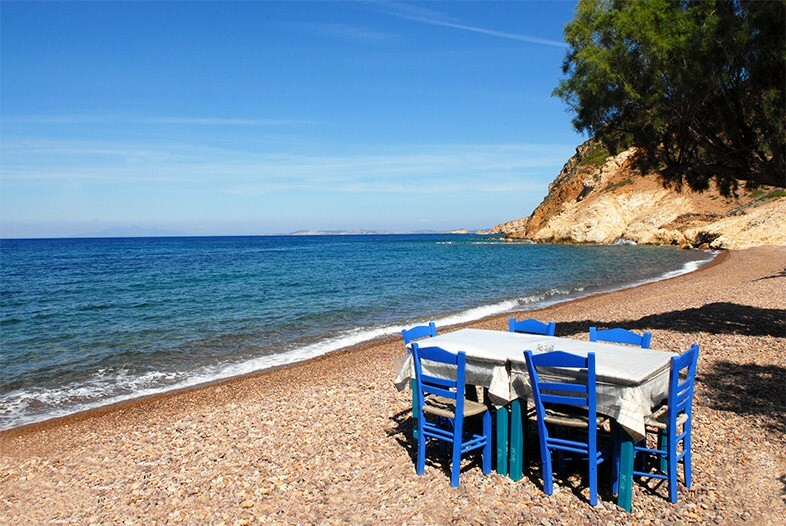 Apart from the fortified monastery in Chora, and the liveliness of Skala, Patmos also has many beautiful beaches. 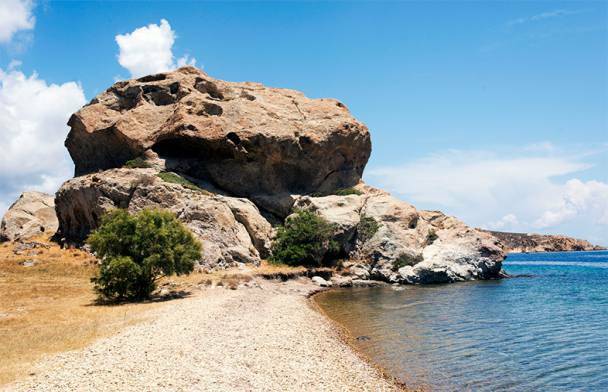 Lambi, in the north of Patmos, is famous for its rare multi-colored pebbles. 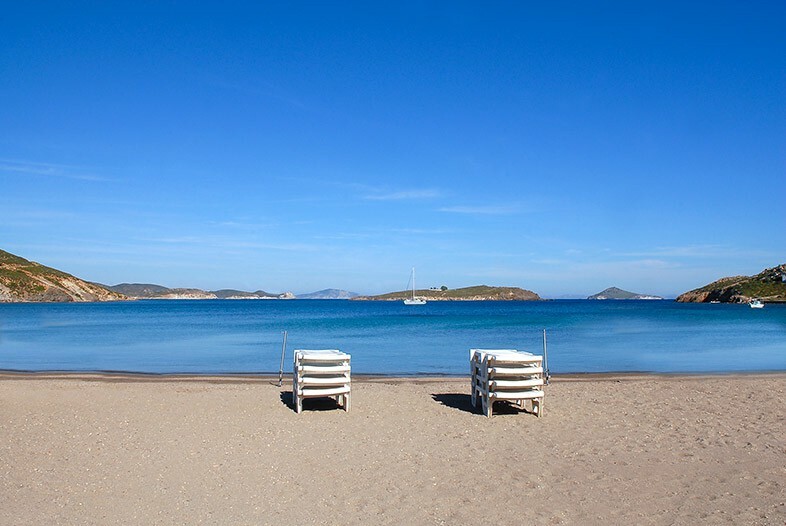 Other famous beaches are Livadi Kalogiron, Agriolivado and Grikos. Certainly, you mustn’t miss visiting the impressive rock known as Petra (or Kalikatsou) to the right of the beach of Grikos. According to geologists, the bizarre-looking formation was created by volcanic activity million years ago. 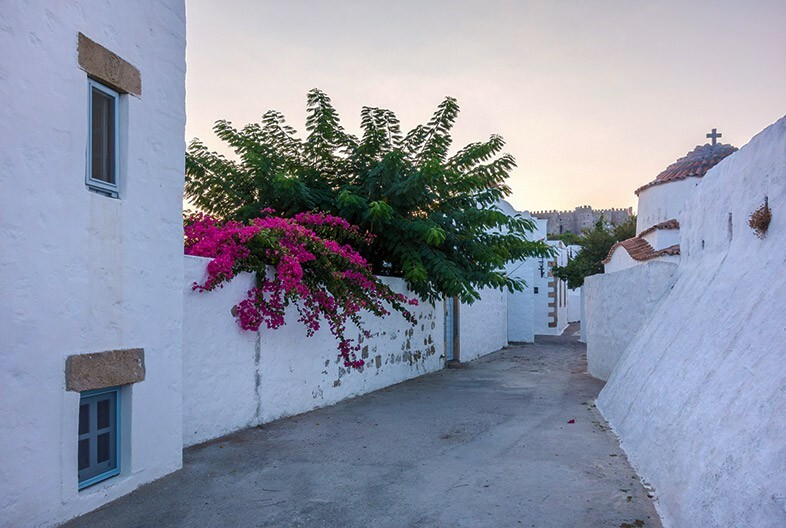 According to Greek Mythology, Patmos existed as an island at the bottom of the sea. Artemis – the goddess of hunting, frequently paid visits to Charia, the mainland across the shore of Patmos. In a shrine of Mount Latmos, Artemis met Selene – the goddess of the moon, who casted her light on the ocean and the sunken island of Patmos was revealed. 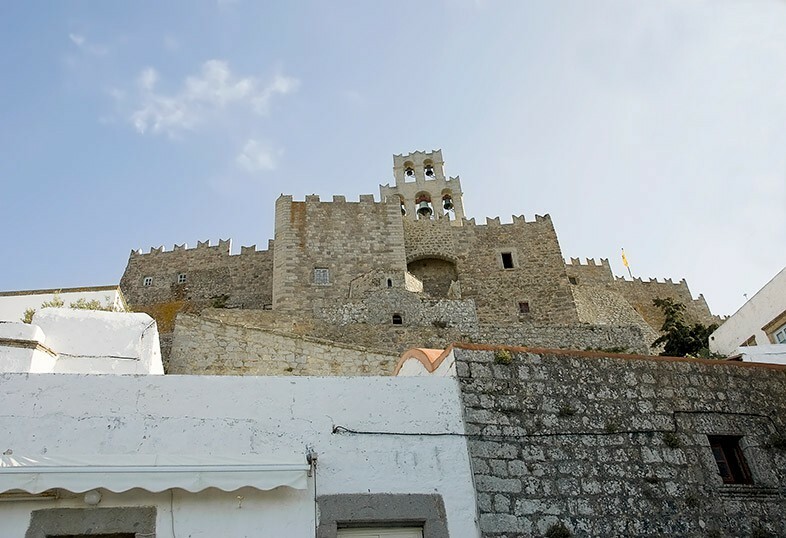 Patmos gained most of its reputation, for being the location of the vision given to disciple John in order to write the Book of Revelation and the place where the book was written. 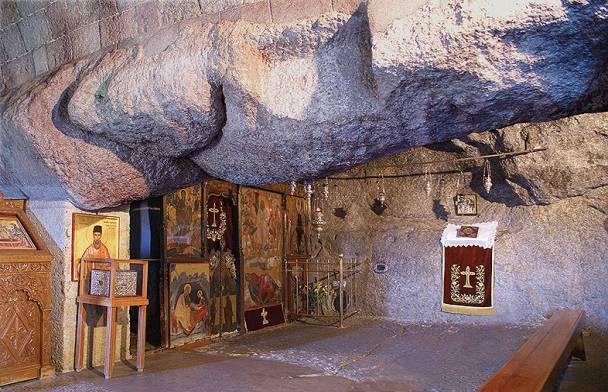 The cave in which Saint John was leaving and the Revelation took place, has been visited by millions of people and is one of the top religious attractions globally. 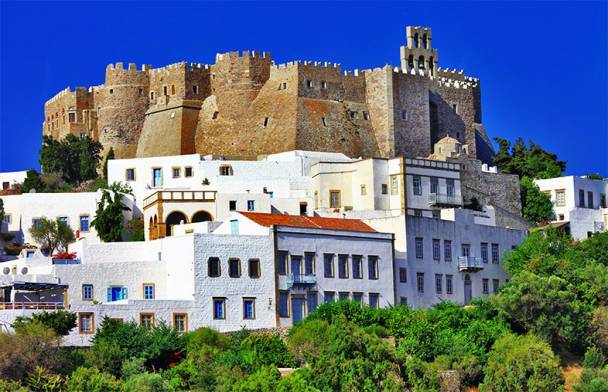 The Holy Monastery of Saint John the Theologian is an Orthodox monastery founded in 1088 in Patmos. In 1999, UNESCO declared it a World Heritage Site. It was built at the point where it is believed that John the Apostle wrote the Gospel and the Revelation near the cave where he had the visions of the Revelation. 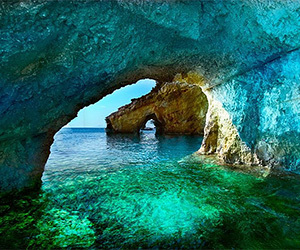 The Holy Cave of the Apocalypse is located on the hill between Skala and Chora. It is a point of reference not only for Patmos, but for Christianity worldwide. The Emperor Domitianos exiled John, the beloved disciple of Jesus to Patmos, punishing him for declaring the Word of God in Ephesus. 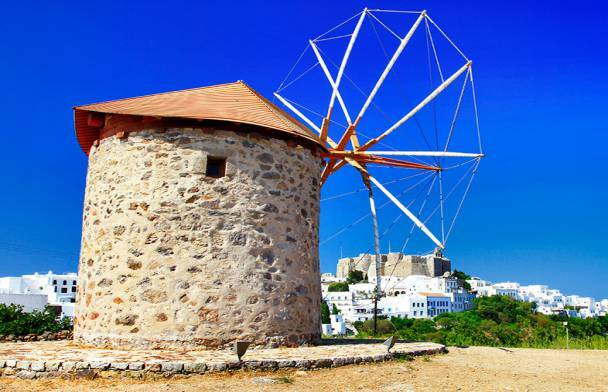 The three windmills of Chora are built on the top of a small hill overlooking the sea, at the east of the Holy Monastery of Patmos. Two of these are dated in 1588, while the third was built in 1863. According to the legend, the Stone of Kalikatsu is the curse of a mother to her daughter who actually happened. 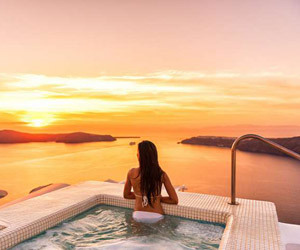 Surprised by the beautiful sea of the bay, and while she had just communed, a girl wanted to dive into the waters.